WHERE to start on Camden’s local election tale: the Labour delight, the Green resistance, the mixed feelings for the Tories, the no show for UKIP. All are topics worthy of deep consideration, but the best entry point is surely Flick, the ‘immovable boulder’ for the Lib Dems in Fortune Green. A mayoral shouldabeen, she saw her party, in happier times, expand from acorns to the Town Hall cabinet. Regardless of how and why, it was some achievement when the Lib Dems found themselves the largest group in Camden in 2006. But now she sits alone. It is a remarkable testament to her own popularity, but also the fall of a party right in front of our eyes. Group leader Keith Moffitt, defeated in West Hampstead, acknowledged that the growth of the party in Camden over this last decade had been accelerated by national politics, the local electorate’s distaste for Tony Blair was obvious when Labour temporarily surrendered its 35 year-old hold on the Town Hall. So, by his own choice of words, the party, and he himself, had ‘lived and died by the sword’ when national arguments turned against them. It’s a fair conclusion, if not a worry that local politics and the debates we have here will largely be trumped, ultimately, by what happens at Downing Street. Keith, by the way, showed a touch of real class in defeat, shaking the hands of those who had defeated him and waiting until the final knockings to see Flick returned after recounts in Fortune Green. Even some Labour rivals acknowledge that a councillor with a proud local record exits here. The stats were bald: Twelve out of 13 Lib Dem seats were lost in Thursday’s typhoon, although the storm had been brewing in by-elections and the London elections of 2012. On each occasion, the Lib Dems were left hurting by sliding results, but they at least had the safety net of local profiles within their wards to pin hopes to at these elections. Surely people would remember the street by street neighbourhood work on polling day? No, not his time – it would all prove, with Flick being the exception to rule, simply not enough against the fury stoked by the collusion with Conservatives at Westminster. The borough’s historically left-leaning electorate clearly felt a level of betrayal. It makes you wonder what the Lib Dems locally could have done to insulate themselves from this punishment. There is a school of thought suggesting the only way for them to have made it to the surface was to make a name for themselves as the stubborn rebels from Camden, refusing to leave the party but demanding change from within and being really strident about it too. They could have been altogether less forgiving, perhaps in a similar way to the approach taken by Frank Dobson at one point, when he seemed to disagree with nearly everything the Labour government was doing but resolved to force policy change from the inside. Whether he was successful in this aim is debatable, but it meant he was distinctive when New Labour was being stabbed. The Camden Lib Dems to a large extent, however, repeated the national mantra that coalition government had been in the nation’s best interests and that cuts would have been worse if they had left the Tories to it. But, the polls show, this ride-to-the-rescue story has not resonated in Camden in the way they would have hoped. Of course, for the group locally, it would have been difficult to condemn the decision to work with the Conservatives in a coalition government, when for the four years before it was formed it had been in a power-sharing pact of its own in Camden with the Tories. It must have made it harder to be distinctive. Some Lib Dems are looking at the local election wipeouts – in Islington, also once run by the party, the whole house went – and the scarring European election results and are questioning the national leadership. There was a hint of this resentment in the air here too. That kind of bite was missing over the last four years. Maybe they have had the same problem in neighbouring in Haringey, another borough where the group leader was dismissed and the party pounded on Thursday. There, any real rebellion might have counted against local MP Lynne Featherstone, who had upgraded to ministerial status after the 2010 result. It must have been quite restrictive to know that stirring unrest against the coalition had the potential to the sting the person they saw as their chief asset. 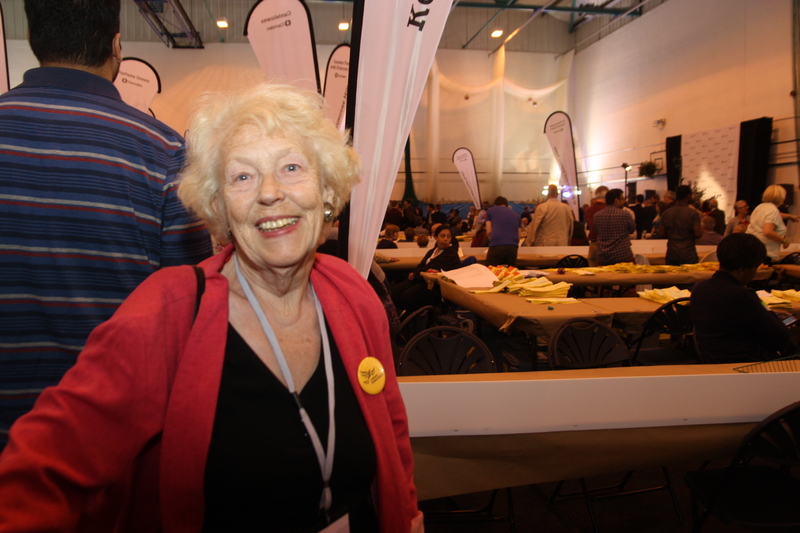 They might have had an easier time of it at these elections if the best known Lib Dem in Haringey had not been at the centre of it all, her years of neighbourhood campaigning eclipsed by what had happened at Westminster. That’s a tale for another borough though, and in Camden, there is Flick, just Flick. Not securing one more seat means the Lib Dem presence at the Town Hall does not rank as a group any more and she must work without the same support services. To get a motion heard at full council, she needs assistance from other quarters. Maya De Souza for the Greens has hinted at how exhausting that can be. You end up speaking on every issue. It also becomes harder to put back the blocks needed to challenge again at the next boroughwide elections. The deflation of feeling like you are starting from scratch, it is needless to say, must feel like falling off the mountainface and finding out that it has started to rain while you work out how to climb it again. Flick promised to retain her energy and defiance on Friday night. A good sport, she joked she was now the group leader, chief whip, scrutiny committee member and so on. For her personally, it does all make it a little difficult to elevate her to the House of Lords, a move which has been discussed in recent years as a way of properly recognising her clear devotion to public service in these parts. One of kind, as committed as she is mischievous, it says something that she polled highest in Fortune Green. She wasn’t even clinging on when the doors fell in. You could hear Lord Paddy Ashdown and others on the television over the weekend reminding people that the Lib Dems have been knocked down before and have still bounced back. Flick too will remind you that she’s been here before, making the best use of small resources. The difference is that the before was before the national coalition with the Tories, a choice which the polling in Camden suggests still haunts every step they take here. I am glad that Flick survived she is a genuinly good sort, and its a shame for the other hard working Lib Dems that their national leadership has lost the plot and cost them their seats. I saw a Tweet from Hampstead Lib Dem Linda Chung who put her loss down a spoiling leaflet on Mansion Tax, but as usual she was wide of the mark she needs to take a long look at the popularity of Nick Clegg and ask herself does she still agree with Nick? Many whatever party they support will, I am sure, regret the loss of some of the Lib Dem Councillors – Paul Braithwaite in particular worked extremely hard and for the most part avoided being overly partisan. Unfortunately the “first three past the post” voting system makes it harder for anyone however good to get elected if they belong to the wrong party. Perhaps we should adopt the method used for the European elections?